What Would It Take To Cut U.S. Data Cables And Halt Internet Access? 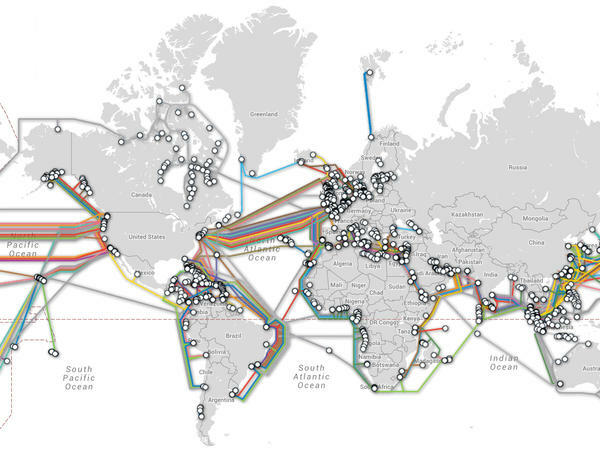 Map of submarine cable systems and their landing stations. In the tense relationship between Russia and the United States, the latest salvo comes via The New York Times: According to American military and intelligence officials, Russian submarines and spy ships are "aggressively operating" near submarine cables that carry Internet communications, raising concerns of a potential attack "in times of tension or conflict." The submarine cables are obscure, yet incredibly vital infrastructure that basically carries most of the communications around the world. Descendants of the old telegraph networks, fiber-optic data cables snake across the bottom of the oceans, linking continents to each other and shuttling the vast majority of all voice and data traffic. "The ultimate Russian hack on the United States could involve severing the fiber-optic cables at some of their hardest-to-access locations to halt the instant communications on which the West's governments, economies and citizens have grown dependent. "What worries Pentagon planners most is that the Russians appear to be looking for vulnerabilities at much greater depths, where the cables are hard to monitor and breaks are hard to find and repair." This would be a new kind of spy operation. In the past, cables have been known to be tapped for secrets (particularly during the Cold War, but possibly much more recently). Cutting the cables is a whole different thing. "You'd need a lot of submarines to actually harm a country like the United States," says Keith Schofield, general manager of the International Cable Protection Committee, whose members collectively oversee almost all of the world's intercontinental submarine cables. Actually, one submarine per each cable, says Tim Stronge, researcher at TeleGeography, which tracks the commercial submarine cable industry. He says the cables run closer when they're near the shore but track different paths, especially out in the ocean. That would make it 15 submarines for the 15 cables connecting the eastern U.S. to Europe (the 16th is going into operation soon). "And if you eliminated all the trans-Atlantic connectivity, well, there's trans-Pacific connectivity you would have to address as well. To cut all those is even more of a fanciful proposition," Stronge says. The reason is that each cable alone, while hugely important to the company that owns it, isn't detrimental to your Internet connection. "Normally, the traffic is diverted if a cable is cut, because clearly any commercial operator wants to ensure their customers still have service ... . And so the traffic is just automatically re-routed to a good route," Schofield tells All Tech. "It's a bit like saying, 'We're going to intercept every interstate highway in the United States, all at the same time, then you'd have a problem with traffic.' If you intercept one, or two, or 10, you can still reroute around it." Stronge also says that much of what regular users look for online, like videos and searches and websites, is hosted domestically and would remain unaffected even in the event of every single U.S.-connected cable going black. "The industry is built to be robust; it's built for failure," he says. Typically, the owners of the cable systems have to deal with cuts near the shore, caused by fishers or dragging anchors. The cables in shallow waters are often especially armored for those threats. Far in the ocean, they're just tiny fiber-optic wires inside a plastic tube, and rarely get disrupted (usually in natural disasters like earthquakes). It costs anywhere from tens of thousands to $1 million or more to lift a deep-sea cable from the bottom of the ocean and work on it, according to Schofield and Stronge. That means serious financial costs would be involved in repairing potential damage, but also costs involved in an attack of this sort. Schofield says the safety of cable network systems is hugely important: "The world's submarine cable telecoms infrastructure is vital; it's the heartbeat of the Internet." But he says it would have to be a "consistent, sustained and diverse" attack to cause a severe problem. "Let's say some foreign entity, some evil doer, like a James Bond villain, cut every single undersea fiber-optic cable connection to the United States," says Stronge, "well, we do still have satellite."